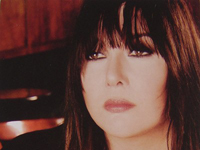 As half of the sister duo that makes up arena rock veterans Heart, vocalist Ann Wilson has sung on some of the biggest rock radio hits of the ’70s and ’80s. Ann Dustin Wilson (born June 19, 1950 in San Diego, California) is also the flute player of Heart. Wilson’s family moved often when she was young (her father was a Marine Corps captain), before eventually settling down for good in Seattle, WA. As a shy teenager (due to a stutter), Wilson turned to music and singing as an outlet. By the late ’60s, she became equally interested in such hard rockers as Led Zeppelin and folk artists as Joni Mitchell, and as a result, her vocals could adapt between the two styles. The early ’70s saw Ann join a local rock outfit, Heart (then White Heart), which led to her trying to unsuccessfully convince her younger sister, guitarist Nancy Wilson, to join up as well. Heart continued on, during which time Ann and Heart guitarist Mike Fisher began a romantic relationship. But before recording could begin on a debut album, Fisher had decided to vacate his guitar spot in favor of becoming the group’s sound engineer, which led to Nancy being offered once more to join the group — and this time, she accepted. The band’s debut album, 1976′s Dreamboat Annie, slowly became a best-seller (especially after being re-released by Capitol Records), as Ann’s soaring vocals contributed to such enduring classic rock radio standards as “Magic Man,” “Crazy on You,” and the title track. Further hit albums (1977′s Little Queen and 1978′s Dog & Butterfly) and singles (“Barracuda”) followed, as Heart became one of the U.S.’ top rock outfits. But the early ’80s saw several big-name rock acts of the previous decade find a hard time adapting to the changing musical climate, which Heart fell victim to (this period was also a turbulent one in Ann’s personal life as well, due to a less than amicable split with Fisher). Although none of Heart’s early-’80s albums performed up to the high standards set by their early releases, Wilson scored a hit with Loverboy singer Mike Reno on the duet power ballad “Almost Paradise” (off the blockbuster 1984 motion picture soundtrack Footloose). Heart switched labels soon after and overhauled their sound and look to keep pace with younger MTV acts. The ploy worked, as their 1985 self-titled comeback album spawned several big hits, including “What About Love,” “These Dreams,” “Never,” and “Nothin’ at All.” Heart continued issuing similarly styled albums throughout the remainder of the ’80s and early ’90s — during which time Ann scored another duet hit, this time singing with Cheap Trick‘s Robin Zander on the track “Surrender to Me” (from 1988′s Tequila Sunrise soundtrack). Ann adopted her daughter Marie in 1991 and her son Dustin in 1998. The ’90s saw Ann and Nancy open their own Seattle recording studio, Bad Animals, during which time the area became a breeding ground for countless chart-topping “grunge” outfits, including Alice in Chains, whom Ann sang with on their 1991 acoustic EP Sap. Ann and Nancy launched a back-to-basics side band soon after, the Lovemongers — debuting with a cover of Led Zeppelin‘s “The Battle of Evermore” on the Singles motion picture soundtrack in 1992. In 1993, the group issued a four-song EP (titled after the aforementioned Zeppelin cover song), but it wouldn’t be until 1997 that the group would issue a proper debut album, Whirlygig. With Heart and the Lovemongers performing and issuing albums sporadically throughout the ’90s and early 21st century, Ann turned her attention mainly toward parenthood. But Wilson continued to perform with others — including such all-star gigs as The British Rock Symphony (alongside Roger Daltrey, Paul Rodgers, etc.) and The Beatles tribute A Walk Down Abbey Road (which also included Todd Rundgren, John Entwistle, and Alan Parsons). She underwent a weight-loss surgery called Adjustable gastric band in January 2002 after what she calls “a lifelong battle” with her weight. In 2006, Ann began recording her first solo album, Hope & Glory, produced by Ben Mink, and released by the Rounder (Zoe) Music Group on September 11, 2007. Hope & Glory features guest appearances from Elton John, k.d. lang, Alison Krauss, Gretchen Wilson, Shawn Colvin, Rufus Wainwright, Wynonna Judd and Deana Carter. Ann’s sister, Nancy, also contributed. The Hope & Glory version of Led Zeppelin‘s “Immigrant Song” is available on Ann’s Official My Space page, and charted as “the #9 most podcasted song of 2007″ on the PMC Top10′s annual countdown.